When I was a child, my dad took me to see Spider-Man (with Tobey MacGuire of course) for the first time. Watching Peter Parker go from being an underprivileged geek to a noble hero instilled a feeling of hope within me. But as I grew up, I realized that Peter Parker and I did not share similar experiences. Peter never had to worry about leaving his drink alone at a party, or if men would scream catcalls if he walked down the street. I yearned to see positive representation of women (let alone queer women) in sci-fi or action films, but it rarely graced the screen in a positive way. Let me put this in perspective: I saw Spider-Man in 2002. It’s 2019 and this year is the first time a woman is headlining a Marvel film. In all my years of watching superhero films, this was one of the first times that I felt “seen” by Hollywood. Stories like mine are an example of why diversity is important to so many people, and it’s why many indie devs want to diversify their games. The upcoming visual novel Love Shore is one promising example that seeks to incorporate diversity within its narrative. Notably, the game features an all-LGBT cast, and is inclusive towards people of color and different backgrounds. I had the opportunity to reach out to writers Son and Emmett, in regards to their project. They too, spoke about the importance of diversity. 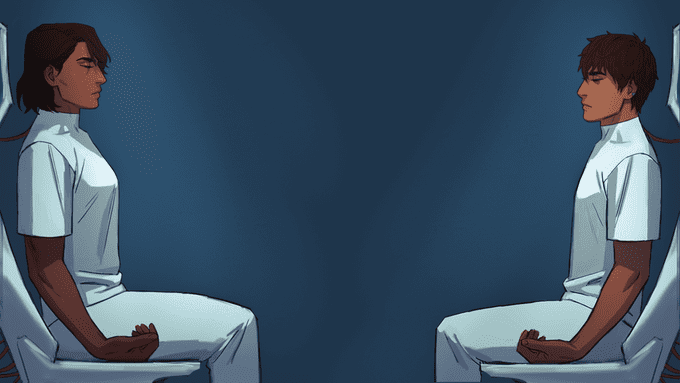 Emmett believes that the visual novel medium has “room to play and grow” when it comes to the representation of people of color, as well as the LGBTQ community. On the left is protagonist Farah; on the opposite end sits protagonist Sam. They are both cyborgs, known as “S.Humans” within the Love Shore world. The concept for Love Shore is interesting, as well, and is reminiscent of many sci-fi themes and narratives. The story centers on two S.Humans, or cyborgs, named Sam and Farah, and their investigations into the criminal underground of the city Love Shore. Farah’s journey focuses on helping her friend Imani through “mysterious stuff,” whereas Sam’s centers on a revenge story. As you play, the storylines of the two protagonists intersect. There are also approval rating mechanics, so you can check on your relationships with other characters. Additionally, Love Shore contains a ratings system based on strength, intelligence and courage. Your stats can potentially open up new dialogue options, providing a dynamic experience. Love Shore is derived from a side story within Son’s own horror work, TEETHING, which Son wanted to expand upon. Son reached out to Emmett via a phone call to talk about the idea. By the end of the call, Son asked Emmett to co-write and co-produce the game, specifically Farah’s route. “I love cyberpunk and I think there’s a lot of untapped potential in the genre to dive into some really cool themes,” said Son. Since its inception, the two have changed a lot of the concepts together. Neither of them had worked on a project of this scale before. Their dedication to their team and understanding of the importance of paying people for their work is also why they have such a large Kickstarter goal — which sits at a whopping $50,000. In a long Twitter thread, Son delved further into this explanation. The demo itself cost $11,000 to make, but was released for free. Although short, it allows you to play through a part of both Farah and Sam’s storylines. The majority of the reviews have been positive. In fact, just search “Love Shore” on Twitter and you’ll find a plethora of tweets from excited gamers. A still of protagonist Sam from the Kickstarter trailer. Ultimately, Son and Emmett hope that the game can challenge perceptions of LGBT content, and that stories with LGBT characters aren’t just relevant to those within the community, but to gamers as a whole. Also, that players will understand that stories with LGBT characters deserve more; that they can be complex, rich in emotional depth, and are capable of addressing dark themes . This is Maya, a local bartender with connections to the criminal underground. They have a week to make their Kickstarter goal. To follow the development of the game, check out their Twitter. If you want to learn more about the game or support it, you can check out the Kickstarter here. And of course, if you want to play the demo, it’s available for free on itch.io.